Broken beat and jazz keys sound tasty! Here’s your head chef, Fred Bwelle AKA Neue Grafik. The friendly-faced Parisian has been brewing quite the rep of late, travelling broadly (Europe/Australia) with the likes of Bradley Zero and Prequel as well as dropping records via Rhythm Section, 22a and Wolf Music. With quite the cocktail of influences to call on, be it his African heritage, French youth or big love of London sounds, Grafik has many a tale to tell. 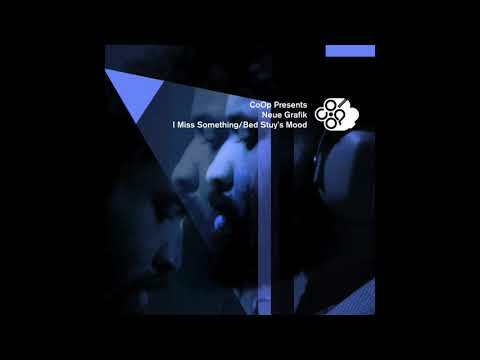 The latest body of work, ‘I Miss Something / Bed Stuy’s Mood’ is one lovely hybrid, featuring some choice remixes from Danvers, EVM 128, NameBrandSound and Xtra Brux. Brought to us by the crew at CoOP Presents, Fred’s next pass, is in a word…tight! As N.G explains ‘This EP is a personal vision of the broken beat scene and my love for that. A meeting with artists who build my own taste, with friends keeping the same vibrancy and desire for this music’.The title track ‘I Miss Something’, is a gorgeous breeze. Immediately, we’re introduced to some of the crispiest snares ever programmed, along with a peppering of synthesized keys and dulcet piano. You’ve arranged to meet the girl of your dreams at your favourite jazz bar, you enter, there she sits looking flawless. It’s this tune that’s spilling from the speakers. Thanks be to you Neue Grafik. Keep delivering refined dance such as this!